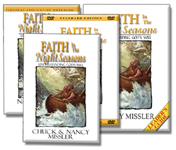 Support your Bible Study using any of these materials with Nancy Missler! Faith in the Night Seasons Have you said, “God where are you? Why are you letting this happen to me?” Have you ever experienced a time in your life where everything is turned upside down and you feel completely abandoned by God? This Bible Study will encourage you to hold onto your faith when night seasons happen. This Personal Application Workbook is designed as a companion to the textbook. You will be encouraged to take the Scriptures taught in the book and apply them in a way that will bring relief to the nagging doubts that God even cares about you or your situation. It is a great encouragement. Faith in the Night Seasons DVD Seminar. Wouldn’t it be great to experience a seminar done by Nancy Missler? Now you can! With this DVD set you can have a great EIGHT HOURS with Nancy showing you the insights that she wrote about in her book. If it seems that no matter how much you read your Bible, pray and seek God, He remains distant and silent, then you need to hear this teaching. It can help you make sense out of the unknown. The guide includes all of the answers to the workbook study questions; an outline of each session; and a cd with all of the charts from the book. LEADER’S DISCOUNTED PACKAGE. This package is great for Bible Study Leaders. Includes the Book, Workbook, Answers to study questions, Leaders Guide, CD with charts and notes and eight hours of DVD teaching. Get it with a great discounted price! Remember that if you are leading a study, we invite you to call with any questions you might have as you prepare and facilitate the group study. You can call us toll-free at (866) 775-5464. Bless you, Herb. Take a look at Nancy’s articles and all the other items listed under “Inspiration” in the menu!